I love the look of freshly tanned skin, the feeling of just been on holiday even though you haven’t. When it comes to self tanning I can be quite lazy, I want it to be and painless when applying and I want it to dry immediately which I know is not really possible when it comes to at home tanning. However, I have now find this little beauty which has changed my tanning life! 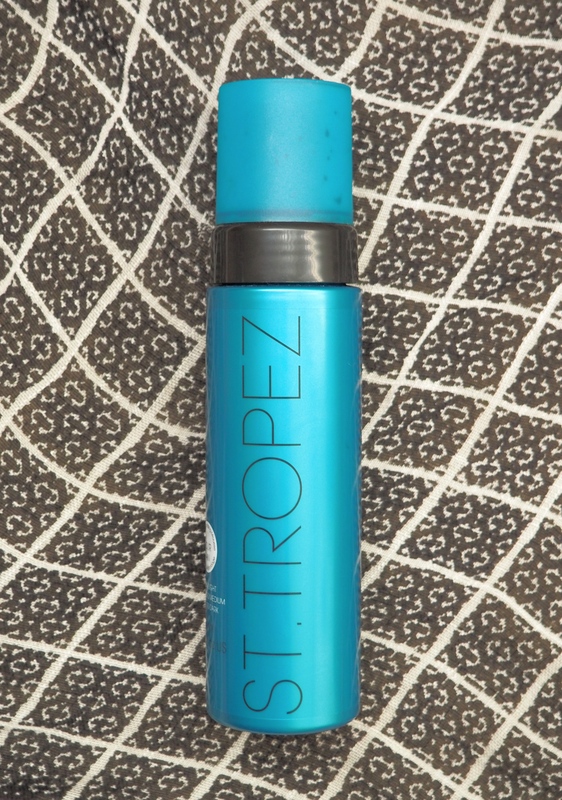 It’s the ST.Tropez Self Tan Express Bronzing Mousse – This promises to give you a sun kissed tan within one hour, now it says that on the bottle however, when you read further into it I found that it was one hour for a light tan and 3 for a deep tan so clearly I go for the 3 hours, I’m not going through all that effort just for the hint of a tan! So what I do with this beauty is make sure I exfoliate the day before applying, I then pump a generous amount on my tanning mitt and apply an even coat all over my body. I have to concentrate on my chest area as well, it really seems to eat up the tan and not get a nice deep colour for some reason. The think I love most about this tan is that it dries so quickly! There is no sitting around waiting fanning yourself waiting for it do dry, it’s pretty much just apply and get dressed and wait for the tan to develop. After about 3 hours or maybe 3 and a half, I jump in the shower and lightly wash it off with a body wash, then viola you have a beautiful sun kissed tan! It also continues to develop for a further 8 hours so do not be afraid if you don’t look super tanned after your shower. I love this stuff so much because it doesn’t give you any orange tones whatsoever it’s an extremely natural bronzed look which is think is due to the olive tone coloured mousse. Another major bonus of this tan is the wear time, I’ve currently be wearing this tan for a week and have not had to exfoliate it off, it wears away very naturally, not patchy which means less work for me in the long run! All in all I think this is a must have for any tan lover out there, the convenience of being able to tan without having to sleep in it and worry about stains on your sheets or being all smelly is a major bonus. I think this is an item that I will always have in my arsenal. Have you tried this product? What are your favourite tanning products?